Do your kids like mazes? My kid definitely does! To discuss the night of Mi’raj, I decided to make a maze, to discuss the journey that Prophet Mohammed (SAW) took on that special night. The journey that night had many elements, but including all these elements would complicate the maze. Of course, if your kids are old enough and ready to understand more about the entire journey, do share more with them! I plan to add a bit more detail during my discussion with my daughter. I used page 243 from here as a resource. This maze starts and ends at the home of the Prophet (SAW). To solve this maze, you must travel to Masjid-ul-Aqsa in Jerusalem. Then, you must travel up through the clouds to the heavens to receive the command for the five daily prayers. After that, you must travel through the maze to return to the home of the Prophet (SAW). 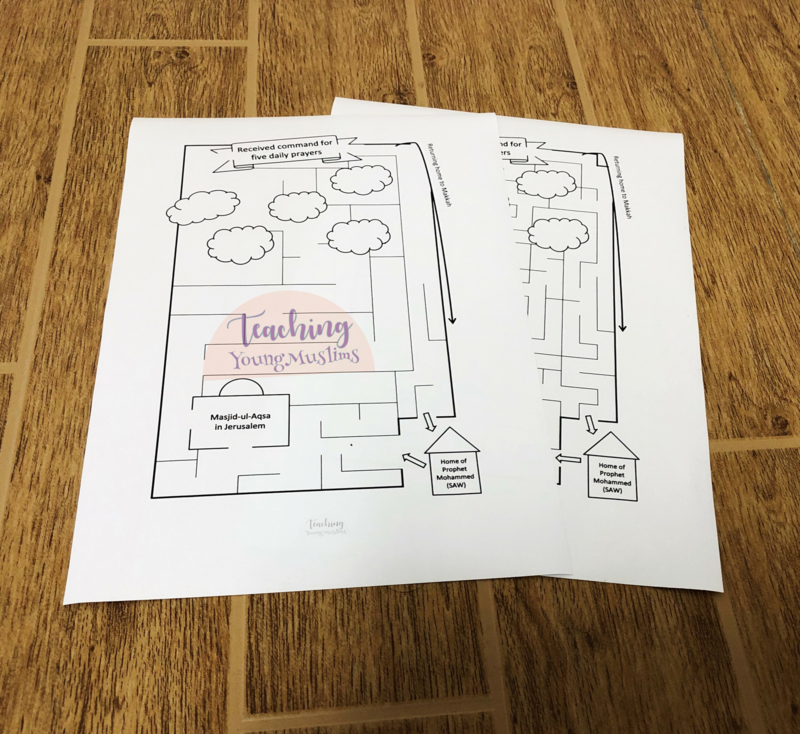 There are two different versions of the maze – easy and difficult. Depending on your child’s experience with mazes and their skill level, you can choose whichever one you prefer. CLICK HERE to download the EASY version. CLICK HERE to download the more DIFFICULT version. Did you enjoy this activity? Are there any other events/stories that you would love to see a maze for? Let me know in the comments below! If you loved this post and want to make sure you don’t miss out on any future posts, subscribe to receive all posts by email on the side! You can also like my page on Facebook and Instagram. Previous PostAl-Muhyi and Al-HafeezNext PostAre we Ready for our 12th Imam (AS)?